KEY WEST, Fla. (AP) - An 18-year-old Canadian swimmer has circled around the island of Key West in 4 hours, 11 minutes and 11 seconds. Cameron McKnight of Waterloo, Ontario, was the first solo finisher in the 12.5-mile Florida Keys Community College Swim Around Key West. He was the race's youngest solo entrant Saturday and is a collegiate swimmer at the University of Waterloo. He also won the men's division. Dale LeClair took top female honors. The 41-year-old from Boca Raton finished in 5:04:20. Nearly 150 competitors, in divisions for solo swimmers and relay teams of 2 to six people, followed a clockwise open-water route that circled the island and encompassed the waters of the Atlantic Ocean and Gulf of Mexico. WATERLOO — Longtime Montreal-based coach Russ Franklin has been named the new skipper of the Region of Waterloo Swim Club. The Winnipeg native has drawn rave reviews from the local swim community, including a former ROW coach and the man he will replace. Franklin enters his new position, which includes dual duties as head coach of Wilfrid Laurier University’s swim team, after spending 35 years in Montreal. He is the former head coach of the Pointe-Claire Swim Club and the Beaconsfield Bluefins. Franklin has a proven track record of guiding Olympic-calibre swimmers including Craig Hutchison and Stephanie Horner, Boles said. His approach is a patient one, Franklin said in a news release. ROW, the 35-year-old Olympic juggernaut, launched the international swim careers of Victor Davis, Mike West, Laura Nicholls, Jennifer Button and, most recently, Keith Beavers. Franklin, in his early 50s, said he was impressed by the club’s commitment to excellence at all levels. Franklin replaces departing ROW head coach Nandi Kormendi who recently handed in his resignation. Franklin assumes his duties on Sept. 1. Waterloo, ON — June 17, 2011 The Region of Waterloo Swim Club (ROW) is pleased to announce the signing of Russ Franklin to the position of Head Coach. Franklin brings with him 35 years of coaching experience. “We are looking forward to having Russ lead our Club. It’s our 35th year serving the Community. Russ knows our history and with his experience, the opportunity and potential is here in Waterloo for more success,” said Tracy Bennett, ROW President. Born in Winnipeg, Manitoba, Franklin’s entire coaching career has been on the West Island of Montreal where he has been the Head Coach of the Pointe-Claire Swim Club and is currently the Head Coach of the Beaconsfield Bluefins. Since 1986, Coach Franklin has had a steady stream of his swimmers compete for Canada at the Junior and Senior levels including swimmers who qualified for the 2000 Sydney Olympics as well as the 2008 Beijing Olympics. “Over the years I have been fortunate to work with a lot of talented, hard working athletes that I have developed from the Novice level to the National Level. I like to think Long Term for each swimmer which allows them to develop at their own pace to reach their full potential as an athlete and a person,” said Franklin. The now 35-year-old ROW Swim Club has a great tradition and history of developing the local talent into elite athletes that compete at all levels in the sport of swimming. ROW Olympians like Mike West, Laura Nicholls, Jen Button, Keith Beavers, and Olympic champion and world record holder Victor Davis, all swam their laps at the Wilfrid Laurier pool. “We are proud of our history and very excited to have signed Russ. His experience will help develop all athletes to reach their potential. Russ can get them all the way to the top as ROW has done for the last 4 Olympics. It was a tough decision and a big move leaving Montreal. We are excited for our Club, but it is a big moment for the Province and swimming in Ontario as well,” said Bennett. Coach Franklin will be taking over the reins of the club on September 1st. Russ knows that the first few weeks will be very busy getting settled in and meeting the members of his new club. “My family is excited about making the move to our new home and I am looking forward to the new opportunities and challenges that lay ahead,” said Franklin. The Region of Waterloo Swim Club is poised to name a new head coach. “This guy will be good,” club president Tracy Bennett said on Wednesday, two days before a replacement for the resigned Nandi Kormendi was to be officially named. That information points to 39-year veteran coach Claude St. Jean, who coached Marianne Limpert to silver at the Atlanta Olympics in 1996, as the new lane foreman at ROW and the varsity coach for the Wilfrid Laurier Golden Hawks. Bennett declined to name her new coach. Editor's Note: Mr. Hicks has it wrong. The name of the new coach will be revealed in a press release Friday. KITCHENER — When it comes to a pioneering spirit in business and athletics, Harry Class was, well, in a class by himself. The indefatigable Class, a record -breaking world champion swimmer and diver and a leader in the frozen food industry, died Saturday at age 95. “He had a happy life, a happy marriage,” said his son, Duncan Class, one of two sons born to Harry and his wife Helen. Harry Class was also one of two sons. He was born in Kitchener to a funeral director father and homemaker mom. The family lived on Homewood Avenue, only a few doors from the Queen Street swimming pool that would later bear his name. “He learned to swim, began entering competitive races,” said Duncan Class. Duncan Class admits he didn't inherit his father's passion for competition in the pool. It would have been hard to keep up with a man so driven to excel to the point that when Harry Class entered the pool chances were the other competitors were struck by a feeling of hopelessness, because he was nearly impossible to beat, particularly in the masters level. As a young man, Class won the Canadian diving championships four times and won a bronze medal at the British Empire Games and broke a Canadian record as a relay team member but all this was only a taste of what was to come once he really hit his stride — or more to the point, his stroke — in his 70s. Class entered the Royal Military College in Kingston and after graduation, joined the Canadian Army Intelligence Corp where he served in Britain during the war. An interesting wartime job no doubt, though he would never talk about his experiences, his son said. Class actually won his last swim titles as a young man while in the army in 1943 when he took the Canadian Senior Men's Diving Championship. He would leave behind his swimming career for 40 years. In his four decade absence, he managed some pretty amazing accomplishments. After discharge from the army, Class joined a firm in Hamilton that was using refrigeration systems developed during the war to transport food for the army. He started as a salesperson but soon became an industry leader in the frozen food business as president and chief executive officer of Mrs. Smith's Frozen Pies, a Simcoe-based company. Class was also president of the Ontario Frozen Food Council and presiding chair at a meeting in 1968 that led to the formation of the Canadian Frozen Food Association. He retired from Mrs. Smith's in 1978 and returned to Kitchener. In his rare spare moments, Class was an active community volunteer, supporting the Canadian Cancer Society as campaign chair. Of course, he also served the swim community as president and coach of the KW YMCA swim team and as director of the Ontario Aquatic Hall of Fame for 11 years where he was inducted as both a builder and a diver and was named an honorary member. But it wasn't until he was 72 that Class went back to the pool as a competitor and he didn't stop until well into his 80s. Class's list of championship titles fills a page: 16 Canadian championships in the 70-74 age group during which he set 16 records. In the next age category, 75-79 he won 50 gold medals as well as four silvers and four bronze, in competitions in Canada, England, Wales, France and the U.S., breaking 37 records. His last championship was in 1992 when he took six gold medals in the Senior Olympics in Michigan. Class once reminisced to a reporter that he never received money for competing and as a young man was often forced to hitchhike to swim meets “with only a quarter in my pocket,” he said. In their retirement, Harry Class and Helen took up the unusual hobby of shell collecting, travelling the world and gathering shells from the tide pools and ocean bottoms while swimming or snorkeling. He once described to a reporter how they would time their trips to coincide with the full moon, when more shells are uncovered as the tide recedes further than usual. In fact, he said most of the shells were discovered as he and Helen walked in tidal pools or snorkeled under a full moon. “Collecting shells is for lovers,” the 82-year-old had dreamily opined. After Helen died in 1991, Class lost interest in his hobby and eventually donated the collection to Themuseum in downtown Kitchener and historic St. Paul's Lutheran Church, which received more than 1,000 seashells. See also the Swim Ontario article. Region of Waterloo Swim Club has been an active member in the community for decades, and it is this club that instills in our youth the practice of a healthily lifestyle, life long friendships, and a competitive attitude. These life skills are instilled in their swimmers through hard work, and training. This past weekend ROW not only excelled but earned 475 team points, placing us second overall at the Western Regional Long Course Championships. ROW had some outstanding swims, and ruled the pool, leaving the meet with over 80 best times, 29 gold medals, 19 silver and 22 bronze. In total, ROW had over 100 top ten finishes. Highlights of the meet included Mohammed Al Moallim receiving the gold in the 200 back, 100 back, and 50 free, as well as qualifying to compete in the provincial championships. During the meet, 12-year-old Lauren Shearer dropped five seconds in the 200 Individual Medley, taking home the gold. Other meet highlights include John Fauteux receiving the gold medal in the 200 Freestyle and dropping over six seconds and Andrew Koo dropping two seconds in the 100 Free, both qualifying for Provincials. This is only some of the amazing swims that took place with weekend! For a full list of results, check out the Swim Canada website! Congratulations to all swimmers! You all did a fantastic job! Waterloo, ON - June 14, 2011 The Board of Directors of the Region of Waterloo Swim Club has accepted the resignation of our head coach, Nandi Kormendi. Nandi will complete his contract and finish this season in August. Nandi has been a valued coach for three years in Senior 2 and two years as our Head Coach as well as the Head Coach for the WLU team. Nandi was with us through the pool closure and successful Save the Pool Campaign. The Board would like to thank Nandi for his time with us and wish him well in his future endeavours. The coaching committee has been actively conducting interviews and an announcement will take place on Friday for our new Head Coach. Thanks again Nandi for your time with ROW. All the best for the future. It has been an exciting, challenging and rewarding time here at the Region of Waterloo Swim Club. Over the past five years I have been grateful for the support given to myself and the Club by so many people in so many ways. At this point it is time to move on to other challenges, and as such I have stepped down as Head Coach effective the end of the season. I am proud of the accomplishments of ROW and its athletes and will watch with continued interest as the Club grows and gains in its successes. Thank-you and good luck to all! This past weekend at Etobicoke’s AGI competition ROW swimmers climbed their way to the top of the medal podium, set a new club record and added qualifiers for the Canadian Age Group Championships. Friday night was a great start for the club, with Margot Cunningham taking the Gold in the 50 Backstroke and Jasmine Raines winning Bronze in the 100 Breast. In addition, Holly Gojmerac qualified for her first Age Group Championships with a fast 50 Back. In the heats that morning, John Fauteux (14 years) broke his own club record in the 100 Breaststroke in a time of 1:12.14. Saturday saw another medal come ROW’s way, with Margot taking the Gold in the 200 Backstroke this time in convincing fashion. John Fauteux continued his record-setting swims this time setting a new ROW Club record in the 50 Breast with a time of 33.78. Holly Gojmerac qualified for Provincial Championships in the 50 Free and Alexander Elliot made his Canadian Age Group Championships cut in the 200 Fly. Sunday saw Margot Cunningham win her third medal of the meet, this time Bronze in the 100 Back. ROW's final hosted meet of the year, Taking Up the Slack, was certainly no ‘slack’ event for the Club. The meet was at capacity with swimmers from the Cobra Swim Club, Oakville, Norfolk, South West Aquatics, University of Waterloo, and St. Thomas Jumbo Jets in attendance. 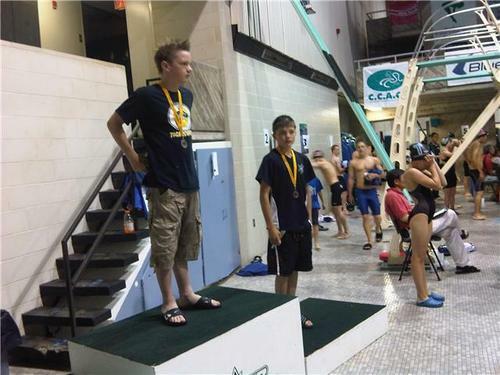 Stepping up their racing to new levels from ROW and qualifying for a Championship meet: Adam Mackenzie qualified for Canadian Age Group Championships in the 100 Breast, Matthew McCuaig who made his first Ontario Provincial Championships time in the 200 IM. Qualifying for the Western Ontario Regional Championships were Emma Frey in the 50 Free, Oscar Judelson-Kelly in the 100 Fly, Robert Pavlinich in the 800 Free, Nina Galle in the 100 Breast and Sarah Patterson-Cole in the 50 Free. Congratulations to all of them for their great racing! Coming up for ROW in June is AGI, and then Regional Championships. July features the main Championship meets of the Long Course season: Ontario Provincial Championships, Senior Nationals and then Canadian Age Group Championships. The annual Division One Team Championships took place in Sudbury, where 16 of Ontario’s top teams sent their best 40 swimmers to compete against each other over three days of racing. The Laurentian University pool was the home to many fine performances by Region of Waterloo Swim Club athletes during the April 15-17 competition. Day One started with medal performances by Margot Cunningham with Silver in the 400 Free, and Graeme Kemp with a Bronze also in the 400 Free. ROW also had two new swimmers qualify for Ontario Provincial Championships with much improved swims in the 100m Fly – congrats to Stephanie Zhang (10) and Felicia Nguyen (10) for their great swims. Day Two saw many really gritty swims in the Finals. Margot Cunningham (17) took Silver in the 100 Back after qualifying 7th, and Dean Bennett (16) won Bronze also in the 100 Back right after placing 8th in the 200 Free. Robbie Gray (16) was 3/100ths of a second shy of a medal, coming in 4th in very tightly contested race. Star of the night for ROW was John Fauteux, who won Silver in the 50 Free and followed it up by winning the 100 Breast in a ROW Club Record time of 1:12.51. In the 200 Free Relays, the 10 & Under Boys team was 7th (Gordon Fountain, Bryan Ling, Braeden Redlich Stowe, Nikki Fauteux), the 13-14 Boys were third (Leonard Zhang, Brad Shushack, Jon Vanderveen, John Fauteux) and the 15 & Over Boys were 5th (Luke Summerhayes, Graeme Kemp, Dean Bennett, Robbie Gray). Day Three saw a second win by John Fauteux, again in Club Record setting fashion, this time in the 200 Breast with a time of 2:38.97. Margot Cunningham again came from 6th place after the heats to claim Bronze in the final. In the 200 Medley Relay, we had 5/7 teams race to top 8 finishes: 10 & Under Girls were 8th (Mackenzie Bender Jones, Felicia Nguyen, Stephanie Zhang, Emma Frey), 10 & Under Boys raced to 5th (Bryan Ling, Gordon Fountain, Nikki Fauteux, Braeden Redlich Stowe), 13-14 Boys 6th (Jon Vanderveen, Kurtis Gray, Andrew Koo, John Fauteux) while the 15 & Over Boys finished 7th (Graeme Kemp, Luke Summerhayes, Dean Bennett, Robbie Gray). After three days of exciting racing ROW finished in 10th place. On Monday April 4, Wilfrid Laurier University had its annual Athletic Awards Banquet and two ROW Coaches were among the athletes honored for their achievement. Bronze 2 Coach Whitney Rich earned her fourth consecutive Most Valuable Player award for her accomplishments on the Laurier Swim Team, as well as named to the OUA All-Star Team. Brittany Shaw, who also coaches Bronze 2, won the Luke Fusco Award for Academic Achievement. This award is given to the athlete with the highest GPA in the university's varsity program. Brittany along with Whitney were co-captains of the Women's Team for the past two years. ROW is very proud of our coaches, who were able to maintain high performance athletics while achieving outstanding academics. At the inaugural Long Course meet of the season for most swimmers, ROW athletes they took the change of course in stride, winning the lion's share of medals. The break over March didn't slow anyone down either with Emma Frey, Ethan Stone, Johanna Gross, McKenzie Bender-Jones, Stephanie Zhang and Sarah El Badawy all qualifying for their first Regional Championships. With seven other teams attending, and a few clubs turned away, the meet full and quite competitive through the age groups. "Our meets this season have been full and we've been turning clubs away", said Head Coach Nandi Kormendi. "This shows the desireability of our meets and is a huge positive reflection on how we run our events. Our Long Course meets were full months in advance. The need for Long Course facilities to handle this demand is clear - and we are fortunate to be where we are with our facility." The City of Kitchener's Athletic Awards Night was held March 8 at Bingeman's, and ROW athletes and coaches were among those recognized for their achievements in the 2010 season. Each year the City of Kitchener recognizes Gold Medal performances at the Provincial and National level for its affiliated teams and athletes. ROW is pleased to be a part of the festivities and proud of the accomplishments of our athletes! Congratulations to Andrew Koo, Dean Bennett, Graeme Kemp, Robbie Gray and Kurtis Gray who were recognized for their successes last year, along with their coaches Matt Mains and Nandi Kormendi. Also recognized were new ROW members Alexis Illes and Deanna Holt-Schmitt for their accomplishments with Synchronized swimming last year. Congratulations to them and hopefully we'll see them at the awards next year as competitive swimmers! 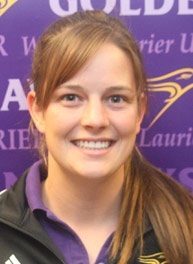 Please join me in congratulating Brittany Shaw on being named the winner of the 2011 Outstanding Women of Laurier Award. The Outstanding Women of Laurier Award recognizes a female Laurier student who combines athletic and academic achievement with an active commitment to leadership and the development of young athletes through community teaching or coaching. It further recognizes the role that Laurier female student-athletes play in furthering the profile of Laurier both on and off the the field. 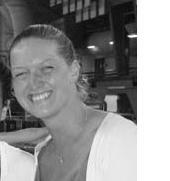 Brittany Shaw is a former ROW swimmer, who is currently coaching Bronze 2 with ROW. Brittany was a finalist for the OWL Award in 2010. This year Brittany's amazing resume lifted her to the top. Brittany is a 4th year bio-chemistry and biotechnology student. She is co-captain of the WLU Golden Hawks Swim Team. This fall Brittany travelled to Egypt to compete in the World Lifesaving Championships as part of the Canadian National Lifeguard Team. In addition to coaching with ROW, Brittany is a volunteer coach for the Special Olympics, volunteers for the WLU Student Offering Support organization and with this group traveled to Nicaragua to help build a school for an underprivileged community. Brittany is a wonderful example of what it means to be involved in sport, school and community. I am very proud of Brittany not only for her accomplishments and recognition, but of having her associated with ROW for so many years. Congratulations Britt! ROW not only produces great swimmers, we develop great people! Go Hawks Go! Go ROW! The Region of Waterloo Swim Club (ROW) successfully completed their Provincial Championship short course season in Nepean this weekend with four athletes and one relay garnering medals for their efforts. With 73 teams scoring points and over 800 athletes, it was one of the toughest fields of competition this year. The top performance for the club came from one of its youngest competitors, Lukas Wormald, winning the gold in the 50 meter backstroke for 11 and under boys, also finaling in the 100 and 200 meter backstrokes. Three other ROW swimmers matched performances at the meet: Jonathan Vanderveen with a bronze in the 100 meter Freestyle (13 year old boys) along with 4th in 200 Free, 5th in 50 Free and 100 Fly, 6th in 100 Back; Margot Cunningham with bronze in her 100 Backstroke and two other final appearances placing 4th in the 200 Back and 6th in the 400 Individual Medley for 16-17 year old girls; Graeme Kemp with a solid third in his 200 meter IM and a near miss (fourth) in the 200 meter Back for 16-17 year old boys. The 12-13 year old boys (Andrew Koo, Marcel Heather, Brad Shushack, and Jonathan Vanderveen) picked up bronze medals in their 200 Freestyle Relay in a hotly contested final. Also contributing to the team performance with top 8 (finals) placings in a total of 10 individual events were: Regan Bartlett-Green (15) 5th in 200 Back; Dean Bennett (16) 7th in 100 Back and 200 IM, 8th in 200 Fly and 400 IM; Robbie Gray (16) coming in 6th in the 100 Free, Andrew Koo (13) 6th in 100 Breast, 7th in 200 Breast; Mckayla Meyer (13) 5th in the 1500 Free; and Jasmine Raines (12) with 5th in the 200 Breast and 7th in the 100 Breast. The ROW 16-17 year old boys also placed in finals in both the 200 and 400 meter Freestyle relays. ROW would like to congratulate our coaches Whitney Rich and Brittany Shaw, who were recognized at the CIS Championships as graduating student-athletes. 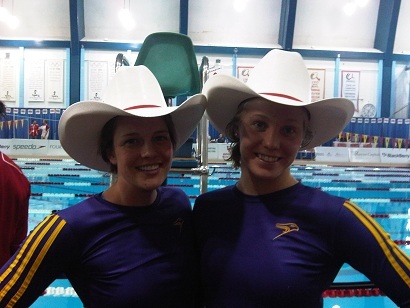 At the CIS Swimming Championships in Calgary, graduating swimmers were presented with an authentic cowboy hat during the Parade of Graduate ceremonies. Just over 450 swimmers from 60 clubs from across the Eastern provinces of Canada came together to race at the Canada Games Aquatic Center in London this past weekend. The Region of Waterloo Swim Club had 11 swimmers qualify and compete over the four-day competition. Margot Cunningham starred for ROW, adding to her National Qualifying times the 50 Back and placing 5th in the 100 Back, 7th in the 200 Back. Graeme Kemp swam to a best time and 8th place in the 200 Back, and with his best time in the 400 IM is in contention to also qualify for Senior Nationals. Ross Bennett had 4 races and 4 best times, showing good form in the sprint events of 50-100 Free, 50 Fly and 50 Back. Also having strong results were Frances Heather and Regan Bartlett-Green, both coming up with big drops in their best times in the 50-100m Backstroke events. Tess Wey showed good speed in the 100 Free, breaking the 1 minute barrier for her first time with a quick 59.60. Next up are the Ontario Provincial Championships in Nepean this weekend. ROW takes it to the podium at Western Region Championships! Region of Waterloo Swim Club sent a large squad of 58 swimmers to Brantford to compete in the Western Region Championships this past weekend, and the team came away with an equally large number of Best Times, Medals, and Ribbons. Along the way two swimmers also qualified for Ontario Junior Provincials – congratulations to Mira Coulombe whose strong 200 Fly made the cut, and to Jimmie Radyk who came up big in the 200 Breast to go comfortably under the standard as well. What really stood out for the coaches was how tough the swimmers were in Finals. Some of the swimmers turned mediocre heat swims into gutsy races leading to best time and medals; others doubled up on great heat swims and found ways to go even faster with great results as well. “The desire to race well was never more evident than when our kids swim at Championships – whether it be the Time Final races for the younger ones or the Finals at night for our older swimmers – they go for it every time” said ROW Head Coach Nandi Kormendi. “It’s always exciting to watch these young athletes at these meets – so much improvement and always a surprise breakthrough to add to the thrill of the meet”. Next up for ROW swimmers is Eastern Canada Cup in London where we have 11 of our top swimmers competing. Immediately after is the Ontario Junior Provincial Championships in Nepean. Good luck to all! Ontario Cup – a great weekend of racing! Ontario Cup was held at the University of Toronto pool January 21-23, 2011. This senior meet was well attended by university teams and clubs alike, and as part of the forward-look towards Olympic Trials next year was held in a Long Course setting. One of the most exciting races of the meet was the facing off between Tobias Oriwol (Beijing Olympian in 200 Backstroke) against Matt Hawes (current Canadian Record holder in the 200 Backstroke). Tobias was out first and fast at the halfway mark, but was caught and passed on the back end of the race by a hard charging Hawes. ROW's Robbie Gray had the chance to race beside Olympian Joe Bartoch in the 100 Free. Robbie hung with Joe all the way, but Joe's experience and speed was too much for Robbie who touched just behind Bartoch with a good swim of 55.59. Bartoch swam the Freestyle race doing Butterfly! Our Region of Waterloo Swim Club competed at home against four other teams from Ontario’s Central and Western Regions on the weekend and ended up more than doubling the total team scores on the competition. In the 10 & under age group our youngest competitors had a great day. Ayshia Bailie placed second in the 50 breaststroke. Braeden Redlich-Stowe scored 5 firsts in the 50/100/200 free, 50/100 back, silver in 100 fly and 200 IM, and a 3rd in the 50 fly. Bryan Ling went gold in the 50 fly, silver in the 50/100 back, and bronze in his 50 free. Djordje Vlaski garnered silvers in the 50/100 breaststroke and bronze in the 200 free. Emma Frey picked up thirds in the 50’s free and back. Felicia Nguyen silvered in her 200’s back and breast, going 3rd in the 100 fly. 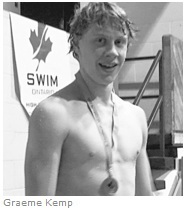 Gord Fountain was bronzed in two – his 100 breast and 200 IM. Jessica Shushack was golden in the 50 free and 100 breast, silvered in the 100 fly and 200’s free and IM. Kelly Rombough mined gold in two – her 400 free and 50 breaststroke, was second in the 50 fly, and picked up bronze in her breaststroke (100/200). Megan Parrott silvered in the 100 back and picked up thirds in three – her 100/200 frees and the 200 IM. Mya Hamley garnered a solid 3rd in the 50 breast. Nick Fauteux broke his back carrying away his treats with 4 gold in the 50 breast, 100’s breast and fly and the 200 IM; three seconds in the 50’s free and fly and the 100 free; and two bronze in the 50/100 backs. Stephanie Zhang attained the top of the podium in the 50’s back and fly and silvered in the 50 freestyle. The 11 year olds were no weaker. Lukas Wormald was the best of the bunch with seven first place finishes: 50/400/800 freestyles, 100 back, 100/200 fly, and the first 400 IM of his season. Lauren Shearer carried away gold in six: 200/800 free, 100/200 back, 100 breast and 400 IM; with a silver in her first 200 fly. Ryan Mackenzie was first in the 50’s breast and fly, silver in his 50/100 free/100 and 200 back/100 breast, and was bronzed in the 100 fly. Mira Coulombe arrived at the finish line first in the 200 fly, performed a quad for the first time with silvers in 200 and 800 free/100 back and 400IM and rounded out with bronze in the 200 back. Breanna Karst went one two in the 50’s back and breast, respectively. Mohammed Al Moallim won the 50 back and took home a bronze in the 50 free. Madison Mckenzie walked away with gold in 50 free. Aidan Elliot silvered in the 50’s back and fly, and picked up bronze in his 200 backstroke. Mya Verhoeve and Nasar Shakir went silver/bronze in the 50’s back/fly and 50’s breast/back respectively. Shannon Kwan was second in her 50 fly. Picking up thirds in their best events were Hannah Judelson-Kelly (200 breast), Isabel Spears (100 breast), and Ryan Rusaw (50 breast). Top 12 year old was Marcel Heather who amassed seven medals, six gold (800 free, 100/200 back, 100/200 fly, 400 IM) and silver in the 100 breast. Ethan Stone mined gold in three (50 each fly/back and 200 IM), silver in 50/100 free, bronze in his 100’s back/breast/fly. Jasmine Raines was golden in three (800 free, 50/100 breast). Hannah Mckay was first in the 200 fly, second in 50free, 100 breast/fly, and third in her 100 back. Alexis Illes went one each in the sprint 50’s – gold in fly, silver in back, bronze in free. Isaac Fountain silvered in 2 (200 breast/IM) and picked up thirds in 2 (50’s free/back). Johanna Gross silvered in the 50 breast and was bronzed in the 50 back. Ahmed Taky Eldin was 2nd in his 50 breast and 3rd in the 50 fly and 200 free. Janessa Swanson was 2nd in her 200 fly and 800 free. Rounding out this age category was Haley Lintner with four bronze (100/200/800 free, 200 fly). Of 13 year olds we have plenty - accompanied by plenty of medal placings. Top point gainer was Mckayla Meyer with 6 first place finishes – 100/200/400/1500 free, 100 breast and 400 IM. The 1500 qualified Mckayla for both Provincial and National AG Champs. In her fun events, the novelty 50’s back and fly she was second and third respectively. Jenny Zhang accumulated 10 medals for her obviously fine efforts. Golds for 50/100/200 back; silver in four (50’s free/breast/fly and 400IM) and bronze in three (100’s breast/fly and 200 fly).Jonathan Vanderveen sprinted to wins in the 50 free and 50 fly, was 2nd in 100/800 free, 100 free and 200IM; and 3rd in 200 free and 400IM. Wennie Zhang gilded the 100/200 fly and bronzed in the 800 free, 100 back and 400IM. 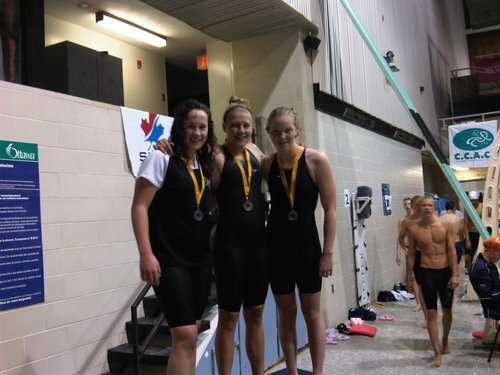 Alyxandra Redlich-Stowe was golden in the 50 breast and silver in the 100 breast. Andrew Koo placed 2nd in the 200 fly and amassed 3 bronze in 50/100 breast and 100 fly. Kurtis Gray picked up two: a silver and bronze in the 100 breast and 50 free respectively. The 100 breast was a provincial cut. Tied with a silver each were Brad Shushack (200 back), Emma Wylie (100 back) and Lauren Cockfield (200 fly).Nina Galle was third in the 200 fly. Fourteen year olds did their share in the team victory. Holly Gojmerac reeled in six big ones (50/100 free, 50’s back and breast, and 100 breast and 200IM). Following were three seconds in 200 free, 50/100 fly. Cassandra Holtby went quadruple gold with victories in 200 free, 50/100/200 fly. Quintuple silvers were recorded in the 50’s free, back, breast, 200/400IM’s. John Fauteux reaped gold in the 50’s breast and fly and 200IM, silver in his 50 back, and triple bronze in 50 free, 200 back and 400IM. Alec Elliot was golden in 50 back and 100 fly; triple silver in 100 back and 50/200 fly and managed a bronze in his 800 free. Adam Mackenzie doubled with firsts in 800 free and 100 breast; picked up a second in 400 free, and again doubled bronze in 100/200 free. Hailey Martin won the 800 free, garnered silvers in 100’s free/breast and 200 back, and a third place in the 200 free. Leonard Zhang won his gold in the 200 free, two silvers in 50/100 free and was third in the 50 breast. Arianne Zamin ordered up a double-double with silver in 200 fly and 800 free and bronze in 100 free and 400IM. While many of ROW’s 15 and Overs competed at Ontario Cup in Toronto the same weekend, those that stayed to race at home also contributed their share of points toward the ROW effort. Cristina Macedo was second in the 200 breast and bronze in the 200 fly. Emily Schueler won her 50 back, and was bronzed three times in 50/100 free and 50 fly. Kayleigh Swanson picked up a 2nd and 3rd in 50 breast and 50 back respectively. Paige Mohaupt won her 800 free and silvered in the 200 fly. Sydney Johnston triple silvered in 50/100 free and 50 fly. Laura Bartlett picked up her bronze in the 50 breast. It was a fun meet. Next up more serious competition at Regionals in Brantford, February 4-6th. On the January 14 – 16 weekend, ROW participated down the road, through blizzard-like conditions, in Etobicoke in a two-tiered competition for our most advanced swimmers. In attendance were teams from across Ontario with many of their top age groupers racing for gold. At the B level, top point achiever for ROW was Adam MacKenzie (14) who walked away with 6 medals, all representing enormous improvements. His four firsts (100/200 breast, 50/200 free) and two seconds (100 free and back) moved Adam within touching distance of Provincials for the first time. Sydney Johnston (16) mined double silver in two of her sprint free swims (100/200 free). Abdulaziz Al Moallim (13) garnered silver in his 200 breastroke event. Alyxandra Redlich-Stowe (13) was right on top of her bests in winning bronze in her 100/200 breaststrokes. And Jacqui Tutssel (14) went bronze in the 50 breast. The A Team did very well as well. Tops was Jonathan Vanderveen (13) with seven medals in all – three gold (50/100 free, 100 fly) and four silver (50 fly, 100 back, 50 breast, 200 free). The 100 back qualified Jon for this summer’s AG Nationals. Following closely in medal totals was eleven year old Lukas Wormald with firsts in 50/100/200 backstrokes and bronze in 100/200 fly. Jasmine Raines (12) continued her torrid pace of improvement with wins in the 50/100 breaststrokes and a solid silver in the 200 of the same stroke. Lauren Shearer (11) and Andrew Koo (13) were tied in productivity with one gold, two each silver and bronze. Lauren’s gold came in her best stroke, the 50 breast; Andrew’s at the opposite end of the continuum in the 200 breast. Silver for Lauren came in the 100 back and 200 breast; her thirds, in the 200 back and 100 breast. Andrew placed second in the 100’s breast and fly, third in 50 breast and 200 fly. Cassandra Holtby was ROW’s final gold medalist, taking the gold in her specialty – the 50 fly; and added a bronze in the 100 fly. Doubling up in silvers were Holly Gojmerac and John Fauteux, both fourteen. Holly claimed hers in the 50/100 back, while John’s came in the 50’s breast and back. With silver and a bronze Alec Elliot (14) had solid performances in his 50 and 100 fly respectively. Mckayla Meyer(13) garnered bronze with a 16 second improvement in the 800 free and a medal of the same hue in the 200 IM. Rounding out our club’s medalist performances were gold from Margot Cunningham in the 100 Back, and single bronze for Jenny and Wennie Zhang, both thirteen. They came in the 50 back for Jen and the 100 fly for Wennie. Next on tap, Regionals in Brantford. The Region of Waterloo Swim Club (ROW) has been an active member in the community for decades, and it is this club that instills in our youth the practice of a healthy lifestyle, life-long friendships, and a competitive attitude. These life skills are instilled in their swimmers through hard work, and training. This past weekend, ROW had the distinct pleasure of participating in the 12 and Under Celebration held in London. ROW had some outstanding swims, and ruled the pool, leaving the meet with over 100 best times, 9 gold, 5 silver, and 2 bronze medals. In total, ROW had over 80 top-ten finishes. Highlights of the meet included Felicia Nguyen receiving the gold in the 200 IM and dropping a grand total of 30 seconds. Felicia also went on to receive the gold in the 100 breaststroke and the silver in the 50 freestyle. Nine-year-old Nicholas Fauteux took home 5 gold medals, and 1 silver, earning himself 5 new best times. Other meet highlights include Megan Parrott and Ryan Mackenzie dropping a combined total of 35 seconds in the 200 IM. Ryan also received the silver medal in the 50 free after dropping 2 seconds off his previous time. From our Bronze 1 group, we also had some outstanding performances. Aidan Elliot earned gold medals in the 50 backstroke with a time of 44.08, and Gordon Fountain earned gold in the 100 fly, and silver in the 100 free, while Guang Chen took silver in the 50 breast. For our Bronze 1 girls, Sarah Shearer took 16 seconds off of her previous best 200 IM and Kathryn Pflug took 8 seconds off her previous 100 back time. In the 10-year-old girls 100 free, Mckenzie Bender-Jones dropped an impressive 13 seconds off her previous best time. ROW is thrilled with the results of the 12 and Under Celebration, and looks forward to seeing more best times in the future. Special congratulations to Alexis Illes, Felicia Nguyen, Megan Parrot, Jessica Shushack, Sabrina Hombach, and Ryan Mackenzie who qualified to compete at the Western Ontario Regional Championships. While most students started their Christmas Break on last Friday, Region of Waterloo Swim Club took the opportunity to send a squad of 42 swimmers to Gatineau to start their Christmas in a different fashion - winning medals at the Gatineau Christmas Invitational. Of note is Margo Cunningham, winning 1 Gold, 5 Silver and 2 Bronze, and on the boys side, Jonathon Vanderveen with 3 Gold, 2 Silver and 2 Bronze medals and Marcel Heather with 2 Gold, 3 Silver and 2 Bronze medals. The inaugural meet for the Gatineau swim club attracted many teams from Ontario, Quebec and even a team from Regina. The meet featured three distinct tiers of competition, allowing clubs to bring different levels of athletes to the meet. A big thanks to our team chaperons Lei Holden and Kim Geimer, and also to those who helped with preparation prior to the team leaving – Renee Schingh, Agnes Holtby, Tania Shushack, Cathy Wiese, Heidi Engelhardt, Karan Johnston, Catherine McKay and Beatrice Mohaupt. From Dec. 10 – 12 ROW athletes tested the heat of competition in Hamilton at the Steeltown Invitational and came away with, in many instances, huge drops and a large pocket full of hardware. Leading the pack of our 10 & unders was Nicholas Fauteux (9) with golds in the 50 m. Breast and Fly and a silver in the 100 Freestyle. A close second in medals was Felicia Nguyen (9) with strong finishes and a medal of each color in capturing gold in her 100 fly, silver in the 200 breast and bronze in the 50 freestyle. Jessica Shushack (10) was second in her 100 back and third in the 200 back with an outstanding improvement of 23 seconds in that swim. Gordon Fountain (9) and Braeden Redlich-Stowe tied as our final medallists in this age grouping with two bronze each in their 50 and 100 backs and the 50 fly/100 free respectively. Top 11 year old was Mira Coulombe with standup performances and four gold in her 50 back, 50 fly, 100 fly and a whopping huge drop of 23 seconds in her 200 fly effort. Lukas Wormald was a strong second in medal count with three gold in each of 200 back, breast and fly. Silvers followed in his 100 back and 200 free swims. 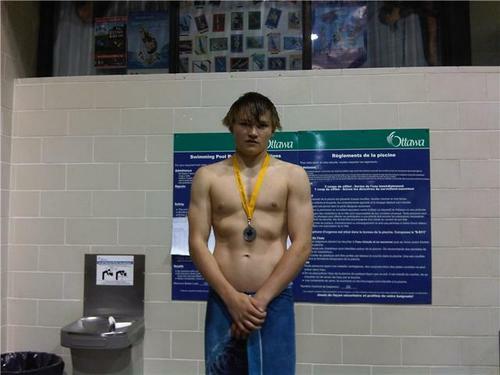 His 200 breast netted him an improvement of 36 seconds. Lauren Shearer went gold in two: the 100 back and 200 breast; silver in the 100/200/400 freestyle; and bronze in her final free swim, the 50 meter event. Our last 11-year old medallist was Isabel Spears with solid performances and a silver in the 100 breastroke and bronze in the 200 metre breast. Mohammed Al Moallim went bronze in his 100 backstroke. Ethan Stone (12) recorded a 12 second drop in his 200 free to garner a bronze medal. Johanna Gross was tops as a 12 year old with a first place finish in the 200 m. breastroke. 13 year olds were strong – really strong. Our best was Cassandra Holtby with three gold and a silver. The gold was mined from the 50 fly, 100 free and the 800 free (a 40 sec. drop); the single silver in a rarely swum 50 m. breastroke. Matt McCuaig ordered up a double double – a gold in each of the 200 breast and fly (24 sec. improvement) and bronze in his 100 fly and 400 IM. Andrew Koo and Brad Shushack tied as far as their medal production was concerned with one gold, a silver and two bronze each. Andrew claimed his podium finishes in his 100 fly, 50 fly, and his double in the 100 free and an infrequently performed 200 back. Brad’s came in well deserved efforts in the 100 breast, 200 back, and the double in the 50 and 200 freestyle events. Jenny Zhang went singles in three events: gold in the 100 fly, silver in the 100 free and bronze in her 800 freestyle. McKayla Meyer doubled with silvers in the 200 back and breast, and bronze in the 100 fly. Abdulaziz swam to two silver in his 100 breast and 200 fly. Lauren Cockfield was strong in placing second in the 200 fly and third in the 100 breast. Second place finishes were recorded by John Fauteux and Katia Myers in the 800 free and 50 back respectively. Nina Galle, Emma Wylie and Wennie Zhang placed third in their 50 breast, 400m. free and 50 fly events. Our final medals came from a trio of 14 year olds. 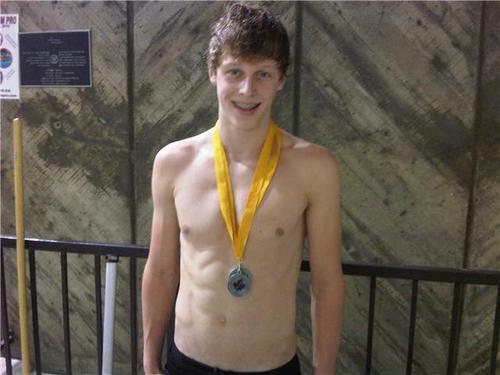 Adam MacKenzie dropped 15 seconds in the 200 back for a respectable silver. Leonard Zhang dropped 30 sec. from the 800 freestyle for a third place finish and equalled that placing in the 50 fly. Jacqi Tutssel was third in her 50 fly. Region of Waterloo Swim Club has been an active member in the community for decades, and it is this club that instills in our youth the practice of a healthily lifestyle, life long friendships, and a competitive attitude. These life skills are instilled in their swimmers through hard work, and training. In recent weeks many of the ROW team members were given the opportunity to compete at the York Swim Club annual Santa Meet! ROW had some outstanding swims, and ruled the pool, leaving the meet with over 50 best times, 19 gold medals, 12 silver and 14 bronzes. In total ROW had over 63 top ten finishes. Highlights of the meet included Darby Gielewski receiving the gold in the 100 IM and dropping a grand total of 29 seconds. Nine year old Nicholas Fauteux dropped a total of 10.66 seconds in the same event. Other meet highlights include Jacob and Tyler Henry dropping a combined total of 45 seconds in the 100 IM. Jessica Shushack also took place first place in the same event dropping a massive 21 seconds from her previous time. From our Bronze 1 group we also had some outstanding performances. Aidan Elliot dropped 20 seconds from his previous 100 IM time, and Gordon Fountain dropping an impressive 8 seconds in the same event. For our Bronze 1 girls Sarah Shearer took 7 seconds off of her previous best 100 IM time earning herself a silver medal in the process. In the 10 year old girls 50 butterfly Mya Hamly dropped 9 seconds, while Stephanie Zhang took Bronze with a time of 47.97, a best time. ROW is thrilled with the results of the York Santa Meet, and is excited to see more best times in the future. Congratulations to all ROW swimmers who participated in the meet! Last night's Region of Waterloo Swim Club 2010 Fundraising Raffle was a huge hit. The prize drawings were made during the ROW AGM meeting on Dec 8, 2010 at Wilfrid Laurier University with assistance by representatives from both the City of Kitchener and City of Waterloo. Congratulations to all our winners and thank you to everyone for your support of the ROW Swim Club. This is a reminder that our next ROW Fundraiser will be our Annual Swim-a-thon on Saturday March 26, 2011. This is a fun and challenging event for everyone (swimmers and parents). Please mark this date down in your calendars. 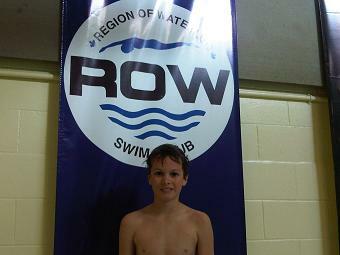 Lukas Wormald, age 10, set a new ROW Swim Club Record in the 400 IM at the ROW Fall First Try Meet. Lukas broke Graeme Kemp's previous record time of 6:19.95 with his posting of 6:16.72. Thirty-one clubs competed at the Brantford International Swim Meet last weekend, drawing from all across Ontario and a team from Quebec. The Region of Waterloo Swim Club sent a squad of 32 athletes to compete against approximately 720 other swimmers. After 3 days of racing Lukas Wormald and John Fauteux emerged victorious with wins in the 50 Free and 100 Free respectively, with four other swimmers earning medals along the way. Fauteux's win went along with a fifth place in the 50 Free and eighth place in the 100 Breast. Wormald also medaled with Silver in the 100 Back, Bronze in the 200 back to go with a fourth in 100 Free, fifth in 200 IM, and sixth in the 100 Fly. Other medalists for ROW were Margot Cunningham with a Silver in the 200 Back, Graeme Kemp with Silver in the 400 IM, Andrew Koo with Bronze in the 200 Breast and Lauren Shearer with two Silvers in the 100 and 200 Breast. The Region of Waterloo Swim Club hosted their first meet of the year on November 6th, and more than just the swimmers came out winners. It was a successful start to the season for the Club with over 200 swimmers participating in the annual start to racing for Region of Waterloo Swim Club athletes. “With so many best times being done so early in the season, all our coaches are excited about how the year is shaping up”, said Head Coach Nandi Kormendi . “We looked good out there, all groups from our newer swimmer to our vets”. The Club dominated the results, winning 95% of the available medals in the meet. "It was a bit lop-sided", said Kormendi about the medal performances of the club's swimmers. "Really this meet was more about seeing where the swimmers are in their preparation and how well they are transferring the skills they are working on in practice to a race situation." The day after hosting Saturday's all-day event, ROW officials were also found on deck helping with a Special Olympic swim meet organized by WLU staff. Kormendi added, “We lent them our electronic meet equipment, and had former and current ROW officials on hand to help with the running of the meet. I'm glad we could help out with their event”. Earlier in the season ROW families participated in a community tree-planting event at Bechtel Park, and took part in the annual Terry Fox Run. White Team triumphs in a closely fought battle for supremacy! After 7 events of competition, the White Team took the final event to win the over-all meet. The morning started with our Team Photo and Long Course Recognition Awards, and then moved into the events. The first event of the competition was the Team Cheer. A valiant effort by the Black Team, but White came up stronger according to the official “Fans in the Stands” Applause-O-Meter. Black Team came back strong though, winning both the 25 Free and 25 Back events to take a 100 to 50 point lead. It was time for a break from the racing and the second Team Challenge: A limbo contest. With no forewarning of the event, each team selected five champions to represent them. Two volunteers (thanks Neil and Eva!) literally lowered the bar on our contestants, with Luke winning the event after many attempts for the White Team. With the meet now tied at 100points each the White Team again took the pool event, winning the 25 Breaststroke races. Not to be shut out of the races, Black Team came back strong to win the 25 Fly event and tie the meet with one race to go. A perennial crowd favorite, the coaches' relay would decide the meet! Both parents and swimmers were cheering on the race, and it was a close race right up until the final 2 swimmers, where the White Team surged ahead to taker event and win the overall meet! This was one of the biggest B&W Meets in recent history - great to see so many of our younger swimmers out! We hope everyone enjoyed the meet and are looking forward to next year's re-match. Our thanks to the many parents who helped make the day go so well: Catherine and Murray McKay for organizing the Swimmer's Breakfast (with great help from Renee Schingh, Lynn and Brian Elliot, Agnes Holtby, Lei Zhang, Tam Nguyen, and Jody McManus, and to Tania Shushack and Kim Geimer for selling the 50/50 tickets. Brittany Shaw heads off to Egypt to compete at Rescue 2010, the World Lifesaving Championships. Coach Brittany, who swam for ROW, and now coaches for ROW in the Bronze 2 Group, is also a co-captain of the Laurier Golden Hawk Swim Team. Coach Britt has been competing in lifeguard competitions for a few years now, and was a member of the Canadian Development Team in 2009. Her strong showing at Canadian National Lifeguard Champs earned her selection to the World Team. Her best event is the 50m manikin carry, where she was ranked 16th in the world last year. During the competition the Canadian Team will be competing in three categories: Surf/Open water, Pool and Emergency response. ROW's “Take the Plunge Challenge” an inaugural success! In conjunction with Canada Sports Day activities, the Region of Waterloo Swim Club got into the spirit of the day with its “Take the Plunge Challenge” on September 15 at the Kitchener's Harry Class Pool. Over 60 swimmers participated in the 800m swim-2.0 km run-800m swim event at the historic outdoor Harry Class Pool. “This was a fun event for the Wilfrid Laurier Swim Team and the Region of Waterloo Swim Club swimmers. Ending the day with a friendly run and swim competition was a break from training for these swimmers” says Head Coach Nandi Kormendi. “Next up is the Terry Fox Run - a traditional event for ROW and another great cause that we support every year”. Region of Waterloo Swim Club swimmers came home fully decorated from the Ontario Summer Games. Waterloo's Robbie Gray and Kitchener's Dean Bennett struck gold as part of the 4 x 100 metre freestyle relay team. Gray also won the top prize in the 50m free and bronze in 100m free and 100m back. Bennett, meanwhile brought home four silvers in the 200m individual medley, the 400m individual medley, the 200m back and the 100m back. We need an outgoing individual who has bookkeeping experience and office administrative experience. This position having at least some website responsibilities, should assist the coaches with their communication responsibilities, help organize and perhaps lead fundraising and membership drives among other duties as they arise. Please submit your applications to ROW via e-mail to ac.gnimmiwswor|tnediserP#ac.gnimmiwswor|tnediserP. The deadline for applications is Friday, August 27th @ 5:00 pm. 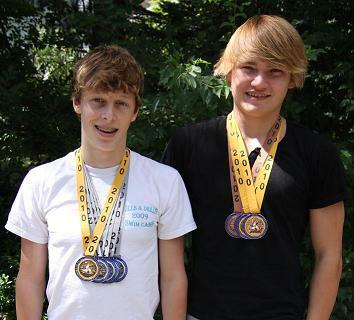 Two Region of Waterloo Swim Club (ROW) swimmers, Robbie Gray (15) and Dean Bennett (15), competed in the Ontario Summer Games August 10-13th. The boys were selected, based on their swimming times up to March 2010 and their age, by the Western Region of Swim Ontario. The boys showed commitment to their sport by training through the summer, as August is usually their rest month. It was an opportunity the two boys felt they earned as multi-medalists at the Provincial level. “It gave us an opportunity to represent our region and try to beat the other regions of the Province”, said Bennett. “Our region had the most team spirit and we all contributed to the points to win the meet!”. The team totalled 800 points beating the second place team by 85 points. It was the first time the Western Region was dominant, as the Central Region has held the title for many years. “We were the loudest cheering and the strongest team, the energy was incredible and it was really fun”, said Gray. The swimming competition had a total of 72 male and 72 female athletes with 6 teams per gender for a total of 24 per region. The meet was held in the Jeno Tihanyi Olympic Gold Pool at Laurentian University in Sudbury. The races took place over all three days as they held preliminary swims and finals each day. The boys stayed with other athletes in the Laurentian University Athletes' Village. The 2010 Ontario Summer Games featured 32 sports and were held in 40 venues across Sudbury. They are the largest multi-sport event in the Province involving 3500 participants and held every two years. VICTORIA - Two-time Olympian swimmer Keith Beavers was applauded by his peers tonight after his retirement ceremony in Victoria during the final night of Swimming Canada's National Championships. It was an emotional night at the Sannich Commonwealth pool as over two hundred swimmers were selected to represent Canada at either the Pan Pacific Championships, the Nations Cup, North American Challenge Cup or the Junior Pan Pacific Championships taking place this summer. The evening started out with inspiring words by newly retired swimmer Keith Beavers of Orangeville, now living in Vancouver. Beavers loved to help out on deck inspiring the next generation of athletes. Sometimes he would even pitch in with coaching duties at the Region of Waterloo (ROW) swim club. During his career, Beavers also swam for the Orangeville Otters and the Toronto All-stars. Beavers emerged as one of Canada's brightest young stars in 2002 when he won the bronze medal and broke the Canadian record in the men's 200 metre backstroke at the Pan Pacific Championships in Yokohama, Japan. Beavers competed at his second Olympic Games in Beijing and posted his fastest times ever. During the 200 IM finals, Beavers put his name next to the national mark that was previously held by long time rival, Brian Johns and swimming heroes Curtis Myden, Alex Baumann and Graham Smith. In 2007, at the Pan American Games in Rio de Janerio, Keith won a bronze medal in the 400m individual medley and posted a personal best time in the 200m IM with a time of 2:01.36. 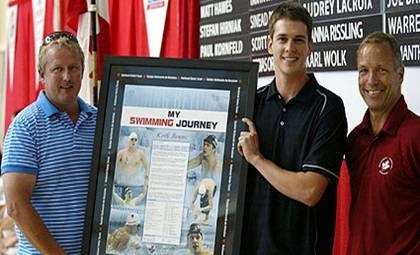 At the 2006 Pan Pacific Trials in Montreal, Keith broke his Canadian record once again in the 200 backstroke, clocking 1:58.97 and earning himself a spot on the 2006 Pan Pacific Championship team where he would once again have the opportunity to swim an international meet in front of a home crowd. In 2004 Beavers had already pre-qualified for the 2004 Olympics in the 200 backstroke with his performance at the World Championships in Barcelona. He made the cut at Olympic Trials by placing first in the 400 IM with at time of 4:17.65. At this year's Pan Pacific Trials, Keith won the gold medal in the 200 backstroke with a remarkable time of 1:58.97 setting a new Canadian Record. Throughout his career, Beavers has represented Canada at two Olympic Games, two World Championships, one Commonwealth Games, one Universiade, one Pan American Games and two Pan Pacific Championships, an accomplishment on its own. Another career highlight for Beavers was at the U.S. Open when he upset double Olympic backstroke champion Lenny Krayzelburg of the U.S. for the gold in the 200 backstroke. Keith, who represented the Region of Waterloo Swim Club under Coach Dean Boles, was encouraged by his parents Don and Arlene to start swimming lessons at the age of 6. His sister Lindsay, was also a national team swimmer. Their continued support has enabled Keith to strive for his personal and swimming goals. He graduated in Kinesiology at the University of Waterloo. The Region of Waterloo Swim Club welcomes Kaitlyn Schultz to our coaching staff. Kaitlyn brings her experience, enthusiasm and imaginative new ideas to our young swimmer's programming here at ROW. She will be lead coach for our Silver and Bronze groups as well as coordinating our youngest swimmers in the Tiny Olympic Prospect (TOP 1) group. “We are working on developing a larger novice program” says ROW President Tracy Bennett. The Kitchener Waterloo Swim School, our novice program for ages 5-10, will operate out of 3 locations this season. “This program expansion is our commitment to develop swim skills in the youth of the community.” Collaborating with both cities as their affiliated Club, ROW is excited about adding another full-time career coach to our line-up. Kaitlyn has been affiliated with swimming in Ontario for over 15 years. Kaitlyn places an emphasis on stroke mechanics, and technique, while making swimming fun. In 2009, Kaitlyn accepted the position of head coach of the Variety Village Flames where she coached both able bodied and paralympic swimmers of all ages. During her tenure there, she successfully placed a swimmer on two consecutive Paralympic World Championship teams. Kaitlyn recently completed her studies towards a B.A. in professional writing at York University and continues her studies towards a bachelor in social work at the University of Waterloo. “I am truly excited to be coming to ROW as I feel that it is a natural progression to my career having taught swimming at various levels and most recently as head coach of the Variety Village Flames in Toronto” said Ms. Schultz. ROW has developed swimmers from age 5 through to adult since 1976. From stroke development and fitness to world competition, ROW swimmers have represented Canada with medal performances at the Olympics, World Championships, Commonwealth Games, Pan Am Games and World Cups, as well as representing the community at the International Children's Games, Provincial and Regional Championships, and local meets. ROW offers full season programs as well as summer and school break programs throughout the year. You can meet Kaitlyn at ROW's next assessment, Saturday, September 18 from 9:00 to 11:00 at the Wilfrid Laurier Pool. For Graeme Kemp the recent Junior Provincials was all about meeting the standard — the national standard for the upcoming Canadian long course swimming championships. “Making nationals is kind of a big thing at this age,” said the 16- year-old member of the Region of Waterloo swim team. That single-minded purpose helped him reach the national standard before the recent Ontario Junior Provincial Championships in Nepean, but he still had to perform well at the meet to qualify for nationals. KITCHENER — It started off with a headache and then she wanted to throw up. Her eyes were darting in their sockets and she was feeling so faint that she had to put her arms over the shoulders of her swimming peers to make it to the change room. “I felt tons of pressure in my left eye. It felt like a vein was bulging from my head,” Monique Begy, now 17, said as she recalled the day her life changed forever. Her swim coach, Dean Boles, gave her two Advil, thinking the headache might be sparked by nerves. She had 15 minutes to go before it was her turn to swim the 100-metre backstroke at the world trials in Montreal. 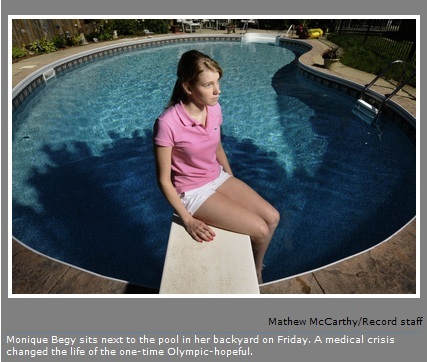 It was July 2009 and Begy — an Olympic hopeful for 2012 and possibly 2016 — was set to swim her best that day. The Region of Waterloo swim club member was breaking club records and meeting provincial swim times, qualifying for national competitions. Minutes later, Begy was in an ambulance. “We almost lost her on that day,” recalls Boles. “I think about it often and I think ‘wow’, how the team of people came together, dropped everything for her,” he said. Begy was bleeding internally within her brain after a brain arteriovenous malformation (AVM) — an abnormal collection of arteries and veins — burst. It becomes deadly when it ruptures and bleeds around the brain. Many live with permanent brain damage or suffer a stroke, debilitating them forever. But Begy, who had immediate surgery at a neurological hospital in Montreal, not only came out of surgery nearly unscathed, she's here to tell it. Her mother, Jane, says others things, other than swimming, are more important now. “She is the strongest person I know. She will inspire others because she has faced adversity head on,” said her mother. Her father, Peter, was in a Montreal hospital for three weeks and saw plenty of people who had permanent damage from the malformation bursting in their brains. Begy's parents didn't go to Montreal for the competition. Peter, who was at work, went online to see how his daughter was doing and noticed she hadn't swum. “I thought she's been training for 10 years, how can she have missed the race,” recalls Peter, who then called his wife at home. Within minutes, Boles was on the phone to Jane, telling her that her daughter had collapsed. Then a surgeon from Montreal called, asking for permission to perform surgery on Begy. “Are you alone? Are you sitting down?” Jane recalls being asked. All Jane could think about was her 16-year-old nephew Luke Santi, who had died of a brain tumour in 2007. She thought it was happening again. Peter flew to Montreal and the doctors showed him his daughter's CAT scan and how doctors had to relieve the pressure on her brain. He asked the doctor if Begy was going to make it. The doctor replied, “You have to call your wife and be prepared that she may not come out of this,” said Peter, who chokes up recalling the thought of possibly losing his daughter. Hour after hour, Peter waited, and in the middle of the night, an orderly came out and told him his daughter was out of surgery and she had made it. The Begys credit the doctors at the Montreal Neurological Hospital with saving her life. Peter also gives credit to the ambulance attendant who drove his daughter to the neurological hospital instead of another hospital, because the attendant could tell by her racing eyes that something was wrong with her brain. “We have to believe in God,” said Jane, who said being in Montreal where expert neurological surgeons were on hand and could operate on her daughter is miraculous. Timing is crucial and if the family had been at their cottage, Begy could have died. “You are meant to be here and do great things,” she says of her daughter. Begy spent three weeks in Montreal before she was airlifted to the London Health Sciences Centre where she had a 12-hour operation to remove the arteriovenous malformation. Although her life was saved, doctors were unable to tell the family if Begy would have permanent damage. After the surgery, Begy was unable to walk or talk, and she couldn't see. To test her cognitive abilities, Begy was repeatedly asked if a stone sinks in water and whether one peels a banana before eating it. Begy started swimming as a toddler and joined the local swim club when she was eight. By 10, she had a club record in the 50-metre backstroke and was meeting provincial times. At 14, she was swimming up to seven times a week at the Wilfrid Laurier University pool, and she was one of the youngest competitors at the Olympic swim trials in Montreal in April 2008. Begy recalls the unforgettable experience. When Begy returned home, she knew the Olympics could be hers if she kept training and improving her speed. Plus, it's in her genes, with her aunt Jennifer McElroy, a former Region of Waterloo swim club member, represented Canada at the Commonwealth Games. The teen, a student at Resurrection Catholic Secondary School, increased her training to nine times a week in the pool and was beating her personal best swim times. “I started training a lot better and got faster and faster,” Begy said. For Begy, life was scheduled and structured around swimming, from 5 a.m. practices to training after school, all the while maintaining a 93 average in school. “(Swimming) was her identity. Monique is a swimmer,” said her mother Jane. The Begys say the hardest part was watching their daughter isolated from her swimming friends and longing to swim again. “As a parent, you watch her in pain and you can't do anything about it,” said Peter. Today, Begy still has some weakness in her left arm, and holding things in her left hand can be difficult. She has physio- and occupational-therapy four times a week at Freeport Hospital. She also wears a neck collar because muscles in her neck were damaged during surgery. She recently finished Grade 11 at Resurrection with the help of tutors at home, because she didn't have the stamina to sit in class all day. Leaving the Region of Waterloo swim club — and swimming — has had a huge impact on Begy's life. But Begy, who recently redecorated her bedroom and took down all the swim medals, said she sees her future in a different light. “I have smaller goals, so I can check them off my list,” said Begy, who plans to attend McGill University in Montreal and possibly study geography or biology. “I don't think I want to swim at the same level, but it will always be part of my life,” said Begy, who hopes to swim on the university varsity team. Boles said Begy's tenacity will take her far, and swimming will always be a part of her. “I don't think it's done for her. Who knows, she's still young,” he said. The University of the Cumberlands Swim Team (Williamsburg, Kentucky) has been recognized by the College Swimming Coaches Association of America (CSCAA) once again for being one of the NAIA schools to earn Team Scholar All-American Spring 2010. The Patriot men swimmers were the only team in the nation to hold a GPA over 3.0 as they held a 3.10 GPA for the season. The lady swimmers placed 5th with a combined GPA of 3.01. The male members of the Patriot swim team who earned NAIA 2010 Individual Scholar All-American status included Jeffrey Belliveau (Waterloo, Ontario, Canada), Cameron Craig (Brownsboro, AL), Andrzej Lenard (Opole, Poland), Robert Miller (Largo, FL), Matt Moon (Taft, CA), Brett Oliver (Carrying Place Ontario, Canada), and Eric Wenstrand (Elizabethtown, KY). Female members of the Patriot swim team who earned NAIA 2010 Individual Scholar All-American status included Brianna Chen (Harrisburg, NC), Holly Oatman (Paducah, KY), Kaycee Perry (Bradenton, FL, and Breanne Schroeder (Ottawa, OH). For more information on Patriot swimming or Patriot athletics visit www.ucumberlands.edu/athletics. ROW has played a large part in Jeff's development as a swimmer and more so as a person. He graduated this past May from UC with a Bachelor of Science in Business Administration and is currently working in Milton for Milton Hydro. Thank you ROW - Coaches, Swimmers & Families of ROW. Region of Waterloo swimmers lit their own fireworks on Canada Day, racing to five individual medals on the opening day of the Ontario Provincial Swimming Championships in Nepean. Winning Silver medals were Margot Cunningham (100 Back), Graeme Kemp (400 IM), Dean Bennett (400 IM) and Robbie Gray (50 Free). Younger brother Kurtis Gray picked up Bronze (200 Breaststroke) to add to the day's medal haul. Relays were a strong part of ROW's day as well, with the 15-17 year old Girls 200 Medley Relay (Margot Cunningham, Leanne Wiese, Frances Heather, Regan Bartlett-Green) winning an exciting swim-off after tying for 8th in the preliminary session, and then using that momentum to place fourth in the final. The 15-17 year old Boys 200 Medley Relay was 7th (Graeme Kemp, Jimmie Radyk, Dean Bennett, Robbie Gray) and the 12-13 year old Boys placed 5th (Alex Elliot, Kurtis Gray, Jonathan Vanderveen, John Fauteux) in the same event. Friday saw our swimmers pick up where they left off, swimming many best times and placing well overall. Graeme Kemp was the day's lone medalist, winning Bronze in the 100 Back. The boy's 12-13 year old 200 Free Relay placed 5th (Fauteux, Koo, Elliot, Vanderveen) and the 15-17 year old Boy's relay was 4th (Gray, Bennett, Riobo, Kemp). Saturday was another strong day for ROW, winning four more medals in action tonight at the Nepean Sportsplex. Starting us off was Robbie Gray (15 years) taking Bronze in the 100 Free in a best time of 55.69. In the next event, Dean Bennett (15 years) improved 2 seconds taking Silver in the 200 IM in 2:18.84, followed by Jimmie Radyk for 7th place. Graeme Kemp (16 years) also won Silver in the 200 IM in 2:13.20, his 3rd medal of the meet. Wrapping up the night for ROW was Margot Cunningham (16 years), who held second spot from start to end of the 200 Back, to come away with her second Silver of the meet in a best time of 2:19.55. The Boys 12-13 year old 400 Medley Relay placed 7th (Elliot, Gray, Vanderveen, Fauteux). On the last day of competition Kurtis Gray swam to his second bronze medal of the meet, this one in the 100 Breaststroke. ROW's top performer, Graeme Kemp, added a Bronze in the 200 Back. In the relays, the 12-13 year old boy's team was 6th in the 400 Free Relay (Vanderveen, Koo, Elliot, Fauteux). Another strong day for ROW, winning four more medals in action tonight at the Nepean Sportsplex. Starting us off was Robbie Gray (15 years) taking Bronze in the 100 Free in a best time of 55.69. In the next event, Dean Bennett (15 years) dropped 2 seconds taking Silver in the 200 IM in 2:18.84, followed by Jimmie Radyk for 7th place. Grame Kemp (16 years) also won Silver in the 200 IM in 2:13.20, his 3rd medal of the meet. Wrapping up the night for ROW was Margot Cunningham (16 years) , who held second spot from start to end of the 200 Back, to come away with her second Silver of the meet in a best time of 2:19.55.